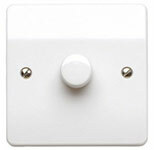 General Lamps Blog - Which dimmer switches are compatible with my LEDs? Which dimmer switches are compatible with my LEDs? Whether you’re installing a new lighting circuit or replacing the lamps in your existing circuit, if you want to use a dimmer switch it’s important to know that the lamps and switch are compatible. To help us on our way, lighting manufacturers provide lists of all the dimmer switches that they have tested their lamps are compatible with. Unfortunately these lists are sometimes hard to find so to make life easier we’ve created this resource. To learn more about mains dimming then read our guide which explains the differences in leading edge and trailing edge dimmers and how to check the min-max loads the dimmer can take. We’ll do our best to make sure the links are kept up-to-date but if you find a link isn’t working do let us know.